How about a Christmas glitter to kick off the Christmas weekend? This one is from Heather's Hues. This is actually a polish I purchased myself not one of the ones I won. I love glittery shades when Christmas comes around. Glitter and Christmas are two peas in a pod. If you're someone who is hesitant about bling, Christmas is the time to not shy away. This glitter isn't shy! Jingle All The Way is a clear base packed with silver holo glitters, red and green glitters, platinum silver flakes, and a mix of multichrome flakes in red, green, and gold. Color: This is jam packed glittery goodness. I love all the glitter elements in this polish and it's definitely over the top but in an amazing way. Formula: The formula was easy to use and apply. I used 2 coats over a base. You could wear this on its own, but it won't be 100% opaque but close enough. Price: This mini 7.5ml size is $6.00 while the larger 15ml size is $10 on Heather's Hues etsy site. Overall: This is a great Christmas glitter. 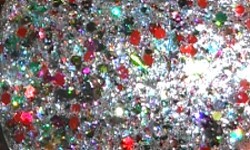 I love all of the glitter elements, the colors, and the multichrome flakes. 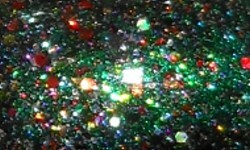 This is a blingtastic polish that won't disappoint the glitter fanatics out there. I wish this was just teensy bit more opaque for my liking so I didn't have to layer it. It may be opaque enough for many, though.